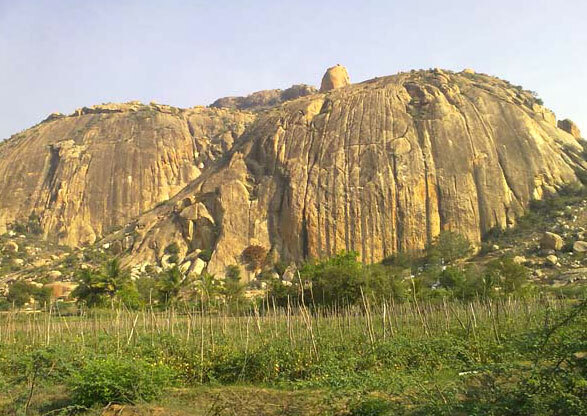 Sri reddamma konda is located in Cherlo Palli which is near to Guraam Konda ( near to Madana Palli town) in Chittor ( Dt)., A.P. India. Devotees will do their childrens ( especially who got children after worshipping amma) “ siromundan” ceremony here. There are all the facilities for this. Some devotees will stay here for days together. All the facilities for cooking, bathing, drinking water ect.. is ready here. Small park also is there for children to play. All pooja samagri (coconut, flowers ect..) & amma vaari prasadam is available. In the morning times tiffin also available. After cherlo palli one small village “Thotli vaari palli” will come. 4 families are there who belongs to Reddamma’s family. From 200 years they are giving some Ayurvedic water for childless woman for best results. So, First Childless woman has to go there at morning 6:30am for 3 Sundays continuously and has to drink that Ayurvedic water. Then she has to go Reddamma Konda. There she has to take bath in Amma vaari Koneru (small water pond). with wet clothes itself she has to take cocanut & one small new clothe (everything is available there ) and keep them in her hands. Infront of Amma’s temple one big banayan tree is there. She has to do sastanga Namaskaara to Amma and has to pray for children. There is a belief that they will get a dream or sleep. Then it is confirmed that they will get children. After that they have to take one small stone and tie in the new clothe and has to tie it to the stem of banayan tree ( it is called in telugu “ Mudupu” ). Then she has to enter into the amma’s temple and give coconut & all Pooja samagari to the priest and pray amma. With that pooja will complete. Childless woman has to do same pooja for 3 Sundays continuously. There are so many cases who got immediate result after doing these pooja.